In the fall of 1993, a new show premiered on Friday nights on Fox. It followed two partners who brought in the bad guys, while encountering strange paranormal events and a government conspiracy to cover them up. It debuted to good ratings and great reviews. And it had a horse who thought he was a human. No, we aren’t talking about the X-Files. We’re talking about that other show, a comedy/western/sf hybrid that was broadcast an hour before Scully and Mulder: The Adventures of Brisco County, Jr. The set-up was a classic western motif: in 1893, bad guy John Bly breaks out of custody with his gang, killing Marshall Brisco County, Sr. Bounty hunter Brisco Jr. is hired by rail barons to hunt down Bly and his gang, but because of the high price on Bly’s head, Brisco is in competition with other bounty hunters, including the notorious Lord Bowler. But Bly has bigger fish to fry, and here’s where the show becomes more than just a western. Bly’s after a mysterious golden orb that has strange mystical powers. Sent on missions by his boss Socrates Poole, Brisco encounters more than his share of outrageous characters along the trail: noted gunslinger Utah Johnny Montana (who used to be called Utah Johnny Cougar Montana but stopped using Cougar as it sounded too pretentious); the hapless bad guy Pete who dies more times than South Park’s Kenny and has an unhealthy attachment to his pistol (“You’re touching my piece! Nobody touches Pete’s Piece!”); Sheriff Aron Viva (an ancestor of Elvis’s); and Professor Wickwire, who invents, among other things, a rocket car, a diving suit and an airship (apparently financed by a German investor named Von Zeppelin). Brisco also has more than a few encounters with a saloon siren, the delectable Dixie Cousins. 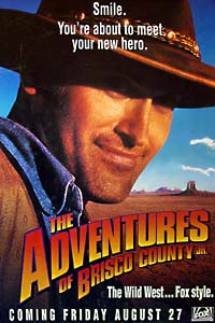 The superb cast is anchored by B-movie hero Bruce Campbell as Brisco. He brings just the right amount of sincerity, strength and good humour to the role. No one will ever accuse him of being a great actor, but Campbell is perfect for this role. It’s hard to imagine anyone else in the part. Julius Carry brought his very large presence to the character of Lord Bowler, a fellow bounty hunter who eventually teams up with Brisco. And the legendary John Astin brought his quirky charms to Professor Wickwire. Plus, special mention must be made of Billy Drago, who played Brisco’s nemesis John Bly like he was from another planet (there’s a hint for you). It’s not hard to see why Brisco’s rating floundered as the season went on and was eventually cancelled after only one season; it’s a very offbeat show, with wacky humour strewn among the pop-cult references. It’s a western poking fun at western conventions. And it’s also a sci-fi show, with the mysterious orb and its fantastic power the driving force behind many episodes. It’s no wonder viewers didn’t know what to make of it, but I enjoyed it a lot. I was surprised that the orb storyline was wrapped up about three-quarters of the way through the season, but I suspect had Brisco returned for a second season that the orb and John Bly would have returned. It was the orb plot that made the show something unique and after that was seemingly dealt with, the show settled back into being just a western, albeit a light and occasionally silly one. And although Brisco was criticized for being an overly violent show back in the day, Brisco never actually shot anyone.